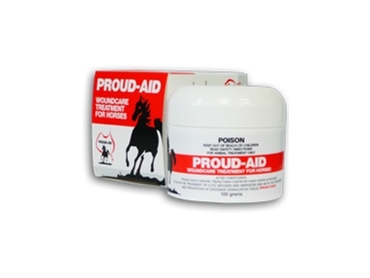 Proud-Aid is a wound treatment formulated to aid in the prevention and treatment of Proud-flesh in horses. The production of exuberant granulation (Proud-flesh) tissue in wounds healing is a commonly encountered complication in horses that can significantly delay wound healing.This is especially the case in wounds located in the distal limb. Factors which contribute to the development of exuberant granulation tissue (Proud-flesh) include a relatively poor blood supply to the distal limb, local tissue hypoxia, infection, movement and chronic irritation attributable to topical irritants. Proud-Aid wound treatment, available from Redmec Pty Ltd , also aids in the treatment of scratches, wire cuts, mud fever, skin irritations and other skin disorders in horses. Proud-Aid wound treatment is a smooth textured paste that is easy to apply and is non irritant to the horse. It helps protect from gross contamination and invasive dirt from entering the wound. Proud-Aid dries rapidly, stays in place and can be used without bandaging.